Off our language he was the lodesterre. Lat no man booste of conning nor vertu, Of tresour, richesse, nor of sapience, Of worldly support, for all cometh of Jesu. 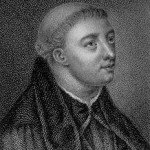 John Lydgate of Bury was born in Lidgate, Suffolk, England. He was an English poet, known principally for long moralistic and devotional works. He studied at Oxford University. In his Testament Lydgate says that while still a boy he became a novice in the Benedictine abbey of Bury St. Edmunds, where he became a priest in 1397. He had few peers in his sheer productiveness; 145,000 lines of his verse survive. He wrote several poems include: Troy Book, Siege of Thebes, and The Fall of Princes.